I am frequently in error but rarely in doubt, so when I am right I have to make sure someone notices. Good news was reported today on job growth nationally, as an estimated 236,000 jobs were added across the country in February. I hate to sound jaded but in each of the prior two years job growth looked to be accelerating early in the year only to experience a significant mid-year slump. For now, however, it is a positive sign. I have been especially and uncharacteristically gloomy in my characterization of NH’s economy but there was some little reported good news on that front released last week. The annual benchmark employment revisions showed that NH has 9,600 more jobs than originally estimated. I won’t get into why the revisions are necessary and can result in some significant changes in the numbers but in my very first post in this blog back in October I highlighted the disconnect between the volume of help-wanted advertising in NH and estimates of job growth in the state. Five months later I think that still sums-up my feelings about the revisions, its good to know we have more jobs but we are still in a growth mode that is too slow. 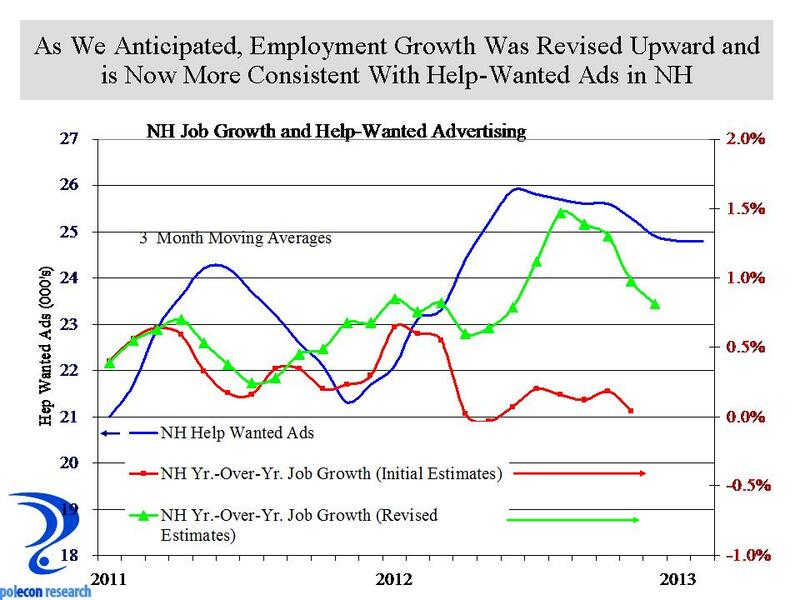 With the revised job numbers for NH the relationship between help-wanted advertising and reported job growth looks more appropriate. 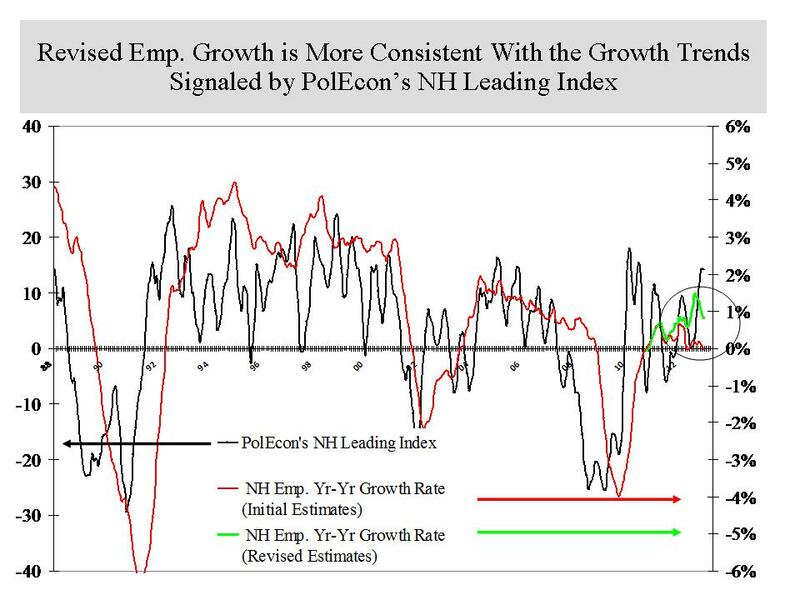 The revised job numbers also are more consistent with PolEcon’s NH Leading Index which had been signalling stronger employment growth in NH than was first reported. The revised job numbers are more consistent with the signals provided by the Leading Index. That may not mean much to anyone but to me it means I won’t have to spend a lot of time re-calibrating the Index and that means a more enjoyable weekend. Enjoy yours. This entry was posted on March 8, 2013 at 11:09 am and is filed under employment, Help Wanted, job growth, Leading Index, NH. You can subscribe via RSS 2.0 feed to this post's comments.